"Republic of Korea" and "ROK" redirect here. For the Democratic People's Republic of Korea, see North Korea. For other uses, see Korea. For and, see ROK (disambiguation). "Benefit broadly in the human world/Devotion to the Welfare of Humanity"
South Korea ( listen), officially the Republic of Korea (ROK; listen), is a sovereign state in East Asia, constituting the southern part of the Korean Peninsula. Officially, its territory consists of the whole Korean Peninsula and its adjacent islands, which are largely mountainous. South Koreans lead a distinctive urban lifestyle, as half of them live in high-rises concentrated in the Seoul Capital Area with 25 million residents and the world's sixth leading global city with the fourth largest economy and seventh most sustainable city in the world. The earliest neolithic Korean pottery dates to 8000 BC, with three kingdoms flourishing in the 1st century BC. The name Korea is derived from one of them, Goguryeo, also known as Koryŏ, which was a Han Chinese tributary state kingdom in East Asia that sent yearly tribute to the Emperor of China, ruling most of the Korean Peninsula and a small portion of Siberia and Inner Mongolia under Gwanggaeto the Great. Since their unification into Later Silla and Balhae in the 7th century, Korea enjoyed over a millennium of relative tranquility under long lasting dynasties. Under Sejong the Great in the 15th century, Koreans had one of the the highest living standards in the world along with the Han Chinese and Japanese and invented many advanced innovations like the metal movable type printing press in 1377 A.D. which was used to print and publish the Jikji, the world's oldest extant movable metal type printed paper book using the 8,000 year old traditional ancient Chinese writing system. Additionally, in 1443 Hangul was invented by the Korean King Sejong the Great as an easier alternative to the complex and difficult to learn ancient Chinese writing system which was usually reserved for elite academic scholars preparing for the imperial examinations of China. Hangul enabled anyone in the general Korean population to easily learn to read and write and transfer written information rather than spending years learning complicated ancient Chinese. Its rich and vibrant culture left 19 UNESCO Intangible Cultural Heritages of Humanity, the third largest in the world, along with 12 World Heritage Sites. Annexed into Imperial Japan in 1910, Korea was divided after its surrender in 1945, but a North Korean invasion led to the Korean War (1950–1953). Peace has since mostly continued with the two agreeing to work peacefully for reunification and the South solidifying peace as a regional power with the world's 10th largest defence budget. South Korea, along with Taiwan, Singapore and Hong Kong (China) is one of the four high-tech industrialized developed countries often referred to as the Four Asian Economic Dragons. The South Korean economy soared at an annual average of 10% for over 30 years in a period of rapid transformation called the Miracle on the Han River. A long legacy of openness and focus on innovation made it successful. Today, it is the world's seventh largest advanced economy and fifth largest exporter with the G20's largest budget surplus and highest credit rating of any country in East Asia. It has free trade agreements with 75% of the world economy and is the only G20 nation trading freely with China, the US and the EU simultaneously. Since 1988, its constitution guarantees a liberal democracy with high government transparency and many fundamental rights such as universal healthcare. High personal freedoms led to the rise of a globally influential pop culture such as K-pop and K-drama, a phenomenon called the Korean Wave, known for its distinctive fashionable and trendy style. Home of the UN Green Climate Fund and GGGI, South Korea is a leader in low carbon green growth, committed to helping developing countries as a major DAC and Paris Club contributor. It is the world's third least ignorant country in the Index of Ignorance, ranking eighth highest for peaceful tolerance and inclusion of minorities on the Fragile States Index. South Korea is a technologically advanced developed country driven by a highly educated and skilled workforce, having the world's eighth highest median household income, the highest in Asia. Globally, it ranks highly in personal safety, job security, ease of doing business and healthcare quality, with the world's third highest health adjusted life expectancy and fourth most efficient healthcare system. It is the world's largest spender on R&D per GDP, leading the OECD in graduates in science and engineering and ranking third in the Youth Wellbeing Index. Home of Samsung, LG and Hyundai-Kia, South Korea was named the world's most innovative country for 4 consecutive years since 2014 in the Bloomberg Innovation Index, ranking first in business R&D intensity, manufacturing value-added, patents filed per GDP, second in higher education efficiency and fourth in high-tech density and researcher concentration. In 2005, it became the world's first country to fully transition to high-speed Internet and today it has the world's fastest Internet speed and highest smartphone ownership, ranking first in ICT Development, e-Government and 4G LTE coverage. The name Korea derives from the name Goryeo (also spelled Koryŏ). The name Goryeo itself was first used by the ancient kingdom of Goguryeo (Koguryŏ) in the 5th century as a shortened form of its name. The 10th-century kingdom of Goryeo succeeded Goguryeo, and thus inherited its name, which was pronounced by visiting Persian merchants as "Korea". The modern spelling of Korea first appeared in the late 17th century in the travel writings of the Dutch East India Company's Hendrick Hamel. Despite the coexistence of the spellings Corea and Korea in 19th century publications, some Koreans believe that Imperial Japan, around the time of the Japanese occupation, intentionally standardised the spelling on Korea, making Japan appear first alphabetically. After Goryeo was replaced by Joseon in 1392, Joseon became the official name for the entire territory, though it was not universally accepted. The new official name has its origin in the ancient country of Gojoseon (Old Joseon). In 1897, the Joseon dynasty changed the official name of the country from Joseon to Daehan Jeguk (Korean Empire). The name Daehan, which means "great Han" literally, derives from Samhan (Three Hans). However, the name Joseon was still widely used by Koreans to refer to their country, though it was no longer the official name. Under Japanese rule, the two names Han and Joseon coexisted. There were several groups who fought for independence, the most notable being the Provisional Government of the Republic of Korea (대한민국 임시정부/大韓民國臨時政府). Following the surrender of Japan, in 1945, the Republic of Korea (대한민국/大韓民國) was adopted as the legal name for the new country. Since the government only controlled the southern part of the Korean Peninsula, the informal term South Korea was coined, becoming increasingly common in the western world. While South Koreans use Han (or Hanguk) to refer to the entire country, North Koreans and Koreans in China use the term Joseon as the name of the country. The history of Korea begins with the founding of Joseon (also known as "Gojoseon", or Old Joseon, to differentiate it with the 14th century dynasty) in 2333 BC by Dangun, according to Korea's foundation mythology. Gojoseon expanded until it controlled the northern Korean Peninsula and parts of Manchuria. Gija Joseon was purportedly founded in the 12th century BC, but its existence and role have been controversial in the modern era. In 108 BC, the Han dynasty defeated Wiman Joseon and installed four commanderies in the northern Korean peninsula. Three of the commanderies fell or retreated westward within a few decades, but the Lelang commandery remained as a center of cultural and economic exchange with successive Chinese dynasties for four centuries, until it was conquered by Goguryeo in 313. During the period known as the Proto–Three Kingdoms of Korea, the states of Buyeo, Okjeo, Dongye, and Samhan occupied the Korean peninsula and southern Manchuria. From them, Goguryeo, Baekje, and Silla emerged to control the peninsula as the Three Kingdoms of Korea. Goguryeo, the largest and most powerful among them, was a highly militaristic state, and competed with various Chinese dynasties during its 700 years of history. Goguryeo experienced a golden age under Gwanggaeto the Great and his son Jangsu, who both subdued Baekje and Silla during their times, achieving a brief unification of the Three Kingdoms of Korea and becoming the most dominant power on the Korean Peninsula. In addition to contesting for control of the Korean Peninsula, Goguryeo had many military conflicts with various Chinese dynasties, most notably the Goguryeo–Sui War, in which Goguryeo defeated a huge force said to number over a million men. Baekje was a great maritime power; its nautical skill, which made it the Phoenicia of East Asia, was instrumental in the dissemination of Buddhism throughout East Asia and continental culture to Japan. Baekje was once a great military power on the Korean Peninsula, especially during the time of Geunchogo, but was critically defeated by Gwanggaeto the Great and declined. Silla was the smallest and weakest of the three, but it used cunning diplomatic means to make opportunistic pacts and alliances with the more powerful Korean kingdoms, and eventually Tang China, to its great advantage. Despite the initial plan of a unified Korea in the 1943 Cairo Declaration, escalating Cold War antagonism between the Soviet Union and the United States eventually led to the establishment of separate governments, each with its own ideology, leading to the division of Korea into two political entities in 1948: North Korea and South Korea. In the South, Syngman Rhee, an opponent of communism, who had been backed and appointed by the United States as head of the provisional government, won the first presidential elections of the newly declared Republic of Korea in May. In the North, a former anti-Japanese guerrilla and communist activist, Kim Il-sung was appointed premier of the Democratic People's Republic of Korea in September. In 1960, a student uprising (the "April 19 Revolution") led to the resignation of the autocratic, corrupt President Syngman Rhee. A period of political instability followed, broken by General Park Chung-hee's May 16 coup against the weak and ineffectual government the next year. Park took over as president until his assassination in 1979, overseeing rapid export-led economic growth as well as implementing political repression. Park was heavily criticised as a ruthless military dictator, who in 1972 extended his rule by creating a new constitution, which gave the president sweeping (almost dictatorial) powers and permitted him to run for an unlimited number of six-year terms. However, the Korean economy developed significantly during Park's tenure and the government developed the nationwide expressway system, the Seoul subway system, and laid the foundation for economic development during his 17-year tenure. Chun subsequently created the National Defense Emergency Policy Committee and took the presidency according to his political plan. Chun and his government held South Korea under a despotic rule until 1987, when a Seoul National University student, Park Jong-chul, was tortured to death. On June 10, the Catholic Priests Association for Justice revealed the incident, igniting the June Democracy Movement around the country. Eventually, Chun's party, the Democratic Justice Party, and its leader, Roh Tae-woo announced the 6.29 Declaration, which included the direct election of the president. Roh went on to win the election by a narrow margin against the two main opposition leaders, Kim Dae-Jung and Kim Young-Sam. In 1988, Seoul hosted the 1988 Summer Olympics. It became a member of the Organization for Economic Co-operation and Development (OECD) in 1996. It was adversely affected by the 1997 Asian Financial Crisis. However, the country recovered and continued its economic growth, albeit at a slower pace. In June 2000, as part of president Kim Dae-jung's "Sunshine Policy" of engagement, a North–South summit took place in Pyongyang, the capital of North Korea. Later that year, Kim received the Nobel Peace Prize "for his work for democracy and human rights in South Korea and in East Asia in general, and for peace and reconciliation with North Korea in particular". However, because of discontent among the population for fruitless approaches to the North under the previous administrations and, amid North Korean provocations, a conservative government was elected in 2007 led by President Lee Myung-bak, former mayor of Seoul. More recently, Park Geun-hye won the South Korean presidential election, 2012. Meanwhile, South Korea and Japan jointly co-hosted the 2002 FIFA World Cup. However, South Korean and Japanese relations later soured because of conflicting claims of sovereignty over the Liancourt Rocks, in what became known as the Liancourt Rocks dispute. In 2016, President Park Geun-hye's administration was accused of corruption, bribery, and influence-peddling for the involvement of Choi Soon-sil in state affairs. Soon-sil was officially charged in November 2016. Following the scandal, there has been a series of massive demonstrations that started in the first week of November 2016. On December 9, the National Assembly voted to impeach Park, suspending her from office. As a result, Prime Minister Hwang Kyo-ahn became the acting President. On March 10, 2017, the Constitutional Court of Korea voted to remove President Park from office immediately, ending her tenure as president. South Korea occupies the southern portion of the Korean Peninsula, which extends some 1,100 km (680 mi) from the Asian mainland. This mountainous peninsula is flanked by the Yellow Sea to the west, and the East Sea to the east. Its southern tip lies on the Korea Strait and the East China Sea. About three thousand islands, mostly small and uninhabited, lie off the western and southern coasts of South Korea. Jeju-do is about 100 kilometres (62 miles) off the southern coast of South Korea. It is the country's largest island, with an area of 1,845 square kilometres (712 square miles). Jeju is also the site of South Korea's highest point: Hallasan, an extinct volcano, reaches 1,950 metres (6,400 feet) above sea level. The easternmost islands of South Korea include Ulleungdo and Liancourt Rocks (Dokdo), while Marado and Socotra Rock are the southernmost islands of South Korea. Due to its development and capabilities, political scientists have ranked it among Asia-Pacific's regional powers. a Revised Romanisation; b See Names of Seoul; c June As of 2016[update]. In April 2016, South Korea's population was estimated to be around 50.8 million by National Statistical Office, with continuing decline of working age population and total fertility rate. The country is noted for its population density, which was an estimated 505 per square kilometer in 2015, more than 10 times the global average. Most South Koreans live in urban areas, because of rapid migration from the countryside during the country's quick economic expansion in the 1970s, 1980s and 1990s. The capital city of Seoul is also the country's largest city and chief industrial center. According to the 2005 census, Seoul had a population of 10 million inhabitants. The Seoul National Capital Area has 24.5 million inhabitants (about half of South Korea's entire population) making it the world's second largest metropolitan area. Other major cities include Busan (3.5 million), Incheon (2.5 million), Daegu (2.5 million), Daejeon (1.4 million), Gwangju (1.4 million) and Ulsan (1.1 million). South Korea is one of the most ethnically homogeneous societies in the world, with more than 99% of inhabitants having Korean ethnicity. The percentage of foreign nationals has been growing rapidly. As of 2009[update], South Korea had 1,106,884 foreign residents, 2.7% of the population; however, more than half of them are ethnic Koreans with a foreign citizenship. For example, migrants from China (PRC) make up 56.5% of foreign nationals, but approximately 70% of the Chinese citizens in Korea are Joseonjok (조선족 in Korean), PRC citizens of Korean ethnicity. Regardless of the ethnicity, there are 28,500 US military personnel serving in South Korea, most serving a one-year unaccompanied tour (though approximately 10% serve longer tours accompanied by family), according to the Korea National Statistical Office. In addition, about 43,000 English teachers from English-speaking countries reside temporarily in Korea. 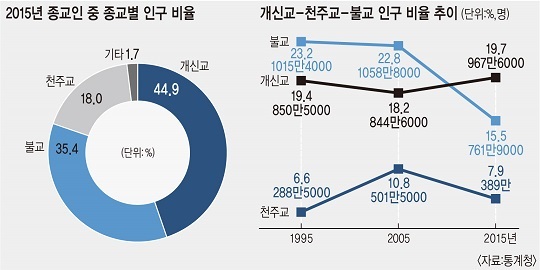 Currently, South Korea has one of the highest rates of growth of foreign born population, with about 30,000 foreign born residents obtaining South Korean citizenship every year since 2010. South Korea's birthrate was the world's lowest in 2009. If this continues, its population is expected to decrease by 13% to 42.3 million in 2050. South Korea's annual birthrate is approximately 9 births per 1000 people. However, the birthrate has increased by 5.7% in 2010 and Korea no longer has the world's lowest birthrate. According to a 2011 report from The Chosun Ilbo, South Korea's total fertility rate (1.23 children born per woman) is higher than those of Taiwan (1.15) and Japan (1.21). The average life expectancy in 2008 was 79.10 years, (which was 34th in the world) but by 2015 it had increased to around 81. South Korea has the steepest decline in working age population of the OECD nations. In 2015, National Statistical Office estimated that the population of the country will have reached its peak by 2035. The front of the science library, Daejeon campus of KAIST depicting the statue of Jang Young Sil, a Korean scientist. A centralized administration in South Korea oversees the process for the education of children from kindergarten to the third and final year of high school. The school year is divided into two semesters, the first of which begins in the beginning of March and ends in mid-July, the second of which begins in late August and ends in mid-February. The schedules are not uniformly standardized and vary from school to school. Most South Korean middle schools and high schools have school uniforms, modeled on western-style uniforms. Boys' uniforms usually consists of trousers and white shirts, and girls wear skirts and white shirts (this only applies in middle schools and high schools). The country adopted a new educational program to increase the number of their foreign students through 2010. According to the Ministry of Education, Science and Technology, the number of scholarships for foreign students in South Korea would have (under the program) doubled by that time, and the number of foreign students would have reached 100,000. South Korea is one of the top-performing OECD countries in reading literacy, maths and sciences with the average student scoring 542 and has one of the worlds highest-educated labour forces among OECD countries. The country is well known for its high feverish outlook on education, where its national obsession with education has been called "education fever". This obsession with education has catapulted the resource poor nation consistently atop the global education rankings where in 2014 national rankings of students’ math and science scores by the Organization for Economic and Cooperation and Development (OECD), South Korea ranked second place worldwide, after Singapore. In 2015, the country spent 4.7% of its GDP on all levels of education – roughly equal to the Organization for Economic Cooperation and Development (OECD) average of 4.7% also. A strong investment in education, a militant drive for success as well as the passion for excellence has helped the resource poor country rapidly grow its economy over the past 60 years from a war torn wasteland. South Korea’s zeal for education and its students’ desires to get into a prestigious university is one of the highest in the world, as the entrance into a top tier higher educational institution leads to a prestigious, secure and well-paid white collar job with the government, banks, a major South Korean conglomerate such as Samsung, Hyundai or LG Electronics. With incredible pressure on high school students to secure places at the nation’s best universities, its institutional reputation and alumni networks are strong predictors of future career prospects. The top three universities in South Korea, often referred to as "SKY", are Seoul National University, Korea University and Yonsei University. Intense competition for top grades and academic pressure to be the top student is deeply ingrained in the psyche of South Korean students at a young age. Yet with only so many places at universities and even fewer places at top-tier companies, many young people remain disappointed and are often unwilling to lower their sights with the result of many feeling as underachievers. There is a major cultural taboo in South Korean society attached to those who have not achieved formal university education where those who don't hold university degrees face social prejudice and are often looked down by others as second-class citizens resulting fewer opportunities for employment, improvement of one's socioeconomic position and prospects for marriage. International reception on the South Korean education system has been divided. It has been praised for various reasons, including its comparatively high test results and its major role in ushering South Korea's economic development creating one of the world's most educated workforces. South Korea's highly enviable academic performance has gotten British education ministers actively remodeling their own curriculum's and exams to try to emulate Korea's militant drive and passion for excellence and high educational achievement. U.S. President Barack Obama has also praised the country's rigorous school system, where over 80 percent of South Korean high school graduates go on to university. The nation's high university entrance rate has created a highly skilled workforce making South Korea among the most highly educated countries in the world with the one of the highest percentage of its citizens holding a tertiary education degree. Bachelor's degrees are held by 68 percent of South Koreans aged 25–34, the most in the OECD. The system's rigid and hierarchical structure has been criticized for stifling creativity and innovation; described as intensely and "brutally" competitive, The system is often blamed for the high suicide rate in the country, particularly the growing rates among those aged 10–19. Various media outlets attribute the nations high suicide rate on the nationwide anxiety around the country's college entrance exams, which determine the trajectory of students entire lives and careers. Former South Korean hagwon teacher Se-Woong Koo wrote that the South Korean education system amounts to child abuse and that it should be "reformed and restructured without delay". The system has also been criticized for producing an excess supply of university graduates creating an overeducated and underemployed labor force; in the first quarter of 2013 alone, nearly 3.3 million South Korean university graduates were jobless, leading many graduates overqualified for jobs requiring less education. Further criticism has been stemmed for causing labor shortages in various skilled blue collar labor and vocational occupations, where many go unfilled as the negative social stigma associated with vocational careers and not having a university degree continues to remain deep-rooted in South Korean society. According to the results of the census of 2015 more than half of the South Korean population (56.9%) declared themselves not affiliated with any religious organizations. Korean shamanism (also known as Sindo or Muism) is the native religion of the Koreans, and it may represent a large part of the unaffiliated. Indeed, according to a 2012 survey, only 15% of the population declared themselves not religious in the sense of "atheism". Of the people who are affiliated with a religious organization, most are Christians and Buddhists. According to the 2015 census, 27.6% of the population were Christians (19.7% identified themselves as Protestants, 7.9% as Roman Catholics), and 15.5% were Buddhists. Other religions include Islam (130.000 Muslims, mostly immigrants), the homegrown sect of Wonbuddhism, and a variety of indigenous religions, including Cheondoism (a Confucianizing religion), Jeungsanism, Daejongism, Daesun Jinrihoe and others. Freedom of religion is guaranteed by the constitution, and there is no state religion. Overall, between the 2005 and 2015 censuses there has been a slight decline of Christianity (down from 29% to 27.6%), a sharp decline of Buddhism (down from 22.8% to 15.5%), and a rise of the unaffiliated population (from 47.2% to 56.9%). Christianity is South Korea's largest organised religion, accounting for more than half of all South Korean adherents of religious organisations. There are approximately 13.5 million Christians in South Korea today; about two thirds of them belonging to Protestant churches, and the rest to the Roman Catholic Church. The number of Protestants has been stagnant throughout the 1990s and the 2000s, but increased to a peak level throughout the 2010s. Roman Catholics increased significantly between the 1980s and the 2000s, but declined throughout the 2010s. Christianity, unlike in other East Asian countries, found fertile ground in Korea in the 18th century, and by the end of the 18th century it persuaded a large part of the population as the declining monarchy supported it and opened the country to widespread proselytism as part of a project of Westernization. The weakness of Korean Sindo, which, unlike Japanese Shinto and China's religious system, never developed into a national religion of high status, combined with the impoverished state of Korean Buddhism (after 500 years of suppression at the hands of the Joseon state, by the 20th century it was virtually extinct) left a free hand to Christian churches. Christianity's similarity to native religious narratives has been studied as another factor that contributed to its success in the peninsula. The Japanese colonisation of the first half of the 20th century further strengthened the identification of Christianity with Korean nationalism, as the Japanese coopted native Korean Sindo into the Nipponic Imperial Shinto that they tried to establish in the peninsula. Widespread Christianization of the Koreans took place during State Shinto, after its abolition, and then in the independent South Korea as the newly established military government supported Christianity and tried to utterly oust native Sindo. Suicide in South Korea is a serious and widespread problem. The suicide rate is the highest in the OECD in 2012 (29.1 deaths per 100,000 persons). Korean hospitals have advanced medical equipment and facilities readily available, ranking 4th for MRI units per capita and 6th for CT scanners per capita in the OECD. It also had the OECD's second largest number of hospital beds per 1000 people at 9.56 beds. Life expectancy has been rising rapidly and Korea ranked 9th in the world for life expectancy at 82 years in 2013, ranking 4th in the world at 85 years. Both North and South Korea continue to officially claim sovereignty over the entire peninsula and any outlying islands. Despite mutual animosity, reconciliation efforts have continued since the initial separation between North and South Korea. Political figures such as Kim Koo worked to reconcile the two governments even after the Korean War. With longstanding animosity following the Korean War from 1950 to 1953, North Korea and South Korea signed an agreement to pursue peace. On October 4, 2007, Roh Moo-Hyun and North Korean leader Kim Jong-il signed an eight-point agreement on issues of permanent peace, high-level talks, economic cooperation, renewal of train services, highway and air travel, and a joint Olympic cheering squad. Despite the Sunshine Policy and efforts at reconciliation, the progress was complicated by North Korean missile tests in 1993, 1998, 2006, 2009, and 2013. As of early 2009[update], relationships between North and South Korea were very tense; North Korea had been reported to have deployed missiles, ended its former agreements with South Korea, and threatened South Korea and the United States not to interfere with a satellite launch it had planned. North and South Korea are still technically at war (having never signed a peace treaty after the Korean War) and share the world's most heavily fortified border. On May 27, 2009, North Korean media declared that the Armistice is no longer valid because of the South Korean government's pledge to "definitely join" the Proliferation Security Initiative. To further complicate and intensify strains between the two nations, the sinking of the South Korean warship Cheonan in March 2010, is affirmed by the South Korean government to have been caused by a North Korean torpedo, which the North denies. President Lee Myung-bak declared in May 2010 that Seoul would cut all trade with North Korea as part of measures primarily aimed at striking back at North Korea diplomatically and financially, except for the joint Kaesong Industrial Project, and humanitarian aid. North Korea initially threatened to sever all ties, to completely abrogate the previous pact of non-aggression, and to expel all South Koreans from a joint industrial zone in Kaesong, but backtracked on its threats and decided to continue its ties with South Korea. Despite the continuing ties, Kaesong industrial zone has seen a large decrease in investment and manpower as a result of this military conflict. In February 2016, the Kaesong complex was closed by Seoul in reaction to North Korea's launch of a rocket earlier in the month unanimously condemned by the United Nations security council. Historically, Korea has had close relations with China. Before the formation of South Korea, Korean independence fighters worked with Chinese soldiers during the Japanese occupation. However, after World War II, the People's Republic of China embraced Maoism while South Korea sought close relations with the United States. The PRC assisted North Korea with manpower and supplies during the Korean War, and in its aftermath the diplomatic relationship between South Korea and the PRC almost completely ceased. Relations thawed gradually and South Korea and the PRC re-established formal diplomatic relations on August 24, 1992. The two countries sought to improve bilateral relations and lifted the forty-year-old trade embargo, and South Korean–Chinese relations have improved steadily since 1992. The Republic of Korea broke off official relations with the Republic of China (Taiwan) upon gaining official relations with the People's Republic of China, which doesn't recognise Taiwan's sovereignty. Longstanding issues such as Japanese war crimes against Korean civilians, the negationist re-writing of Japanese textbooks relating Japanese atrocities during World War II, the territorial disputes over the Liancourt Rocks, known in South Korea as "Dokdo" and in Japan as "Takeshima", and visits by Japanese politicians to the Yasukuni Shrine, honoring Japanese soldiers killed at war. continue to trouble Korean-Japanese relations. The Liancourt Rocks were the first Korean territories to be forcibly colonized by Japan in 1905. Though it was again returned to Korea along with the rest of the its territory in 1951 with the signing of the Treaty of San Francisco, Japan does not recant on its claims that the Liancourt Rocks are Japanese territory. In response to then-Prime Minister Junichiro Koizumi's visits to the Yasukuni Shrine, former President Roh Moo-hyun suspended all summit talks between South Korea and Japan in 2009. The unresolved tension with North Korea have prompted South Korea to allocate 2.6% of its GDP and 15% of all government spending to its military (Government share of GDP: 14.967%), while maintaining compulsory conscription for men. Consequently, South Korea has the world's sixth largest number of active troops (650,000 in 2011), the world's second-largest number of reserve troops (3,200,000 in 2011) and the eleventh largest defense budget. The Republic of Korea, with both regular and reserve military force numbering 3.7 million regular personnel among a total national population of 50 million people, has the second highest number of soldiers per capita in the world, after the Democratic People's Republic of Korea. The United States has stationed a substantial contingent of troops in South Korea since the Korean War to defend South Korea in case of East Asian military crises. There are approximately 28,500 U.S. Military personnel stationed in Korea, most of them serving one year unaccompanied tours. The American troops, which are primarily ground and air units, are assigned to USFK and mainly assigned to the Eighth United States Army of the US Army and Seventh Air Force of the US Air Force. They are stationed in installations at Osan, Kunsan, Yongsan, Dongducheon, Sungbuk, Camp Humphreys, and Daegu, as well as at Camp Bonifas in the DMZ Joint Security Area. A still functioning UN Command is technically the top of the chain of command of all forces in South Korea, including the US forces and the entire South Korean military – if a sudden escalation of war between North and South Korea were to occur the United States would assume control of the South Korean armed forces in all military and paramilitary moves. However, in September 2006, the Presidents of the United States and the Republic of Korea agreed that South Korea should assume the lead for its own defense. In early 2007, the U.S. Secretary of Defense and ROK Minister of National Defense determined that South Korea will assume wartime operational control of its forces on December 1, 2015. USFK will transform into a new joint-warfighting command, provisionally described as Korea Command (KORCOM). South Korea's mixed economy ranks 11th nominal and 13th purchasing power parity GDP in the world, identifying it as one of the G-20 major economies. It is a developed country with a high-income economy and is the most industrialized member country of the OECD. South Korean brands such as LG Electronics and Samsung are internationally famous. With its massive investment in education has taken the country from mass illiteracy to a major international technological powerhouse. The country's national economy benefits from a highly skilled workforce and is among the most educated countries in the world with the one of the highest percentage of its citizens holding a tertiary education degree. South Korea's economy was one of the world's fastest-growing from the early 1960s to the late 1990s, and South Korea is still one of the fastest-growing developed countries in the 2000s, along with Hong Kong, Singapore, and Taiwan, the other three Asian Tigers. South Koreans refer to this growth as the Miracle on the Han River. The South Korean economy is heavily dependent on international trade, and in 2014, South Korea was the 5th largest exporter and 7th largest importer in the world. In 2012, 11.1 million foreign tourists visited South Korea, making it the 20th most visited country in the world, up from 8.5 million in 2010. Due to Hallyu, South Korea welcomed more than 12 million visitors in 2013 with 6 million tourists coming from China alone. With rising tourist prospects, especially from foreign countries outside of Asia, the South Korean government has set a target of attracting 20 million foreign tourists a year by 2017. Hallyu's positive effects of the nation's entertainment industry are not limited to within its culture industry, according to a study by the Hyundai Research Institute. The Hyundai Research Institute reported that the Korean Wave has a direct impact in encouraging direct foreign investment back into the country through demand for products, and the tourism industry. Among Asian countries, China was the most receptive, investing 1.4 billion in South Korea, with much of the investment within its service sector, a sevenfold increase from 2001. According to economist, Han Sang-Wan, shown an analysis that a 1 percent increase of exports of Korean cultural content pushes consumer goods exports up 0.083 percent while a 1 percent increase in Korean pop content exports to a country produces a 0.019 percent bump in tourism. South Korea's old-age pension scheme covers individuals age 60 or older for the rest of their life as long as they have satisfied the minimum of 20 years of national pension coverage before hand. Individuals with a minimum of 10 years covered under the national pension scheme and who are 60 years of age are able to be covered by under a 'reduced old-age pension' scheme. There also is an 'active old-age pension' scheme that covers individuals age 60 to 65 engaged in activities yielding earned income. Individuals age of 55 and younger that 60 who are not engaged in activities yielding earned income are eligible to be covered under the 'early old-age pension' scheme. Around 60% of all Korean elders, age 65 and over are entitled to a 5% benefit of their past average income at an average of 90,000 Korean Won (KRW). Basic old-age pension schemes covered individuals 65 years of age who earned below an amount set by presidential order. In 2010, that ceiling was 700,00 KRW for a single individual and 1,120,000 for a couple, equivalent to around $600.00 and $960.00. Following cyberattacks in the first half of 2013, whereby government, news-media, television station, and bank websites were compromised, the national government committed to the training of 5,000 new cybersecurity experts by 2017. The South Korean government blamed its northern counterpart for these attacks, as well as incidents that occurred in 2009, 2011 and 2012, but Pyongyang denies the accusations. In addition to domestic consumption, South Korea has a thriving entertainment industry where entertainment including televised dramas, films, and popular music has generated significant financial revenues for the nation's economy. The cultural phenomenon known as Hallyu or the "Korean Wave", has swept many countries across Asia making South Korea a major soft power as an exporter of popular culture and entertainment, rivaling Western nations such as the United States and the United Kingdom. Until the 1990s, trot and traditional Korean folk based ballads dominated South Korean popular music. The emergence of the rap group Seo Taiji and Boys in 1992 marked a turning point for South Korean popular music, also known as K-pop, as the genre modernized itself from incorporating elements of popular musical genres from the West such as Western popular music, classical, hip hop, rhythm and blues, electronic dance, jazz, reggae, country, folk, and rock into its traditional Korean music roots. Western-style pop, hip hop, rhythm and blues, rock, electronic dance oriented acts have become dominant in the South Korean popular music scene, though trot is still enjoyed among older South Koreans. K-pop stars and groups are well known across Asia and have found international fame making millions of dollars in export revenue. Many K-pop acts have been able secure a strong overseas following using online social media platforms such as the video sharing website YouTube. South Korean singer PSY became an international sensation when his song "Gangnam Style" topped global music charts in 2012. South Korean television shows have become popular outside of Korea. Many dramas tend to have a romantic focus, such as Princess Hours, You're Beautiful, Playful Kiss, My Name is Kim Sam Soon, Boys Over Flowers, Winter Sonata, Autumn in My Heart, Full House, City Hunter, All About Eve, Secret Garden, I Can Hear Your Voice, Master's Sun, My Love from the Star, Healer, Descendants of the Sun and Guardian: The Lonely and Great God. Historical dramas have included Faith, Dae Jang Geum, The Legend, Dong Yi, Moon Embracing the Sun, and Sungkyunkwan Scandal. There are many official public holidays in South Korea. Korean New Year's Day, or "Seollal", is celebrated on the first day of the Korean lunar calendar. Korean Independence Day falls on March 1, and commemorates the March 1 Movement of 1919. Memorial Day is celebrated on June 6, and its purpose is to honor the men and women who died in South Korea's independence movement. Constitution Day is on July 17, and it celebrates the promulgation of Constitution of the Republic of Korea. Liberation Day, on August 15, celebrates Korea's liberation from the Empire of Japan in 1945. Every 15th day of the 8th lunar month, Koreans celebrate the Midautumn Festival, in which Koreans visit their ancestral hometowns and eat a variety of traditional Korean foods. On October 1, Armed Forces day is celebrated, honoring the military forces of South Korea. October 3 is National Foundation Day. Hangul Day, on October 9 commemorates the invention of hangul, the native alphabet of the Korean language. There are also unofficial holidays celebrated in Korea, such as Pepero Day, which has been criticized by many people as a marketing scam. ↑ 지표상세. Index.go.kr (July 19, 2016). Retrieved 2016-10-05. ↑ 11.0 11.1 This article incorporates public domain material from websites or documents of the CIA World Factbook. ↑ [수도권]‘응팔 아파트’ 만들기 서울시의 이색 도전 : 뉴스 : 동아닷컴. News.donga.com (January 7, 2016). Retrieved June 20, 2016. ↑ Global Metro Monitor |Brookings Institution. Brookings.edu (January 22, 2015). Retrieved June 20, 2016. ↑ Chong Pil Choe, Martin T. Bale, "Current Perspectives on Settlement, Subsistence, and Cultivation in Prehistoric Korea", (2002), Arctic Anthropology, 39: 1–2, pp. 95–121. ↑ What do you do when you reach the top?. Economist.com (November 12, 2011). Retrieved June 20, 2016. ↑ As percentage of government budget surplus. ↑ As rated by the three major credit rating agencies of S&P, Fitch and Moody's. ↑ Korean cultural export success rooted in freedom and democracy, industry insiders say. Scmp.com. Retrieved June 20, 2016. ↑ Green growth in action: Korea. OECD. Retrieved June 20, 2016. ↑ Group Grievance indicator – Fragile States Index. Fsi.fundforpeace.org. Retrieved June 20, 2016. ↑ Ahonen, Tomi; O'Reilly, Jim (2007). Digital Korea. futuretext. p. 173. ISBN 978-0-9556069-0-8. ↑ UN E-Government Survey 2014. Unpan3.un.org. Retrieved June 20, 2016. ↑ Early Korea. Shsu.edu. Retrieved April 17, 2015. ↑ Turnbull, Stephen (November 20, 2012). The Samurai Invasion of Korea 1592–98. Osprey Publishing. p. 17. Retrieved March 25, 2015. <templatestyles src="Module:Citation/CS1/styles.css"></templatestyles> "His naval victories were to prove decisive in the Japanese defeat, although Yi was to die during his final battle in 1598." ↑ Perez, Louis (2013). Japan At War: An Encyclopedia. Santa Barbara, California: ABC-CLIO. p. 140. <templatestyles src="Module:Citation/CS1/styles.css"></templatestyles>"Just as a complete Japanese victory appeared imminent, Admiral Yi entered the war and quickly turned the tide." ↑ Perez, Louis (2013). Japan At War: An Encyclopedia. Santa Barbara, California: ABC-CLIO. pp. 140–141. <templatestyles src="Module:Citation/CS1/styles.css"></templatestyles>"Yi's successes gave Korea complete control of the sea lanes around the peninsula, and the Korean navy was able to intercept most of the supplies and communications between Japan and Korea"
↑ "20 years later, father still seeks truth in son's death", The Hankyoreh, January 15, 2007. Retrieved July 15, 2010. ↑ "About Korea". Paris: OECD. ↑ Climate data in seoul, 1971 ~ 2000(Korean), Korea Meteorological Administration. ↑ "Childbirths in S. Korea grow 5.7 pct in 2010". Yonhap News Agency. August 24, 2011. ↑ "Korea's Total Fertility Rate Still Near the Bottom of the World". The Chosun Ilbo. November 17, 2011. ↑ (French) Health at a Glance 2015 |OECD READ edition. Keepeek.com. Retrieved June 20, 2016. ↑ Bomi Lim (May 26, 2011). "Korea Aerospace Signs Deal to Sell Trainer Jets to Indonesia" 20, 2011/https://web.archive.org/web/20110720001632/http://www.thejakartaglobe.com/home/korea-aerospace-signs-deal-to-sell-trainer-jets-to-indonesia/443285 Archived July 20, 2011 at the Wayback Machine. The Jakarta Globe. ↑ Science/News/News/KBS World Radio. World.kbs.co.kr. Retrieved June 20, 2016. ↑ Hallyu fuels foreign investment in Korea 20, 2015/https://web.archive.org/web/20150120095450/https://www.koreatimes.co.kr/www/news/biz/2014/08/488_163871.html Archived January 20, 2015 at the Wayback Machine. Koreatimes.co.kr (August 31, 2014). Retrieved April 17, 2015. ↑ 317.0 317.1 Bang, Ha-Nam, Study of Korean Corporations’ Retirement Allowance Schemes, Korea Labor Institute, 1998. ↑ Samsung number One in the World 15, 2013/https://web.archive.org/web/20130115201200/http://www.ameinfo.com/66004.html Archived January 15, 2013 at the Wayback Machine, International Data Corporation, January 29, 2010. Retrieved July 7, 2010. ↑ Cho Jin-seo (February 12, 2006). "Terrestrial-DMB adds color to Korean lifestyle" 30, 2011/https://web.archive.org/web/20110430041909/http://www.asiamedia.ucla.edu/article-eastasia.asp?parentid=38998 Archived April 30, 2011 at the Wayback Machine, The Korea Times (Seoul). "Facts from 'Digital Korea'", CNN Asia, October 16, 2007. Retrieved July 7, 2010. ↑ "S. Korea Completes Work on Naro Space Center" 17, 2015/https://web.archive.org/web/20150417164905/https://www.koreatimes.co.kr/www/news/nation/2009/09/113_46562.html Archived April 17, 2015 at the Wayback Machine, The Korea Times (Seoul), June 10, 2009. Retrieved July 15, 2010. ↑ Special Report: [Business Opportunities] R&D. Ministry of Knowledge Economy, September 3, 2007. Retrieved July 15, 2009. ↑ (Korean) Whitney Biennal to come to Seoul again, Seoul News, March 26, 2010. Retrieved July 13, 2010. ↑ "Korean buildings that captivate world", Asia News, January 15, 2010; Lee Hoo-nam (April 16, 2009). "Still, slow waters of Korean architecture", Joongang Daily (Seoul). Retrieved July 10, 2010. ↑ 재미있는 동양3국의 젓가락 문화비교. Article.joins.com (May 19, 2012). Retrieved 2016-10-05. ↑ Trading Markets.com. "S. Korean Game Developer NCsoft Interested in Pro Baseball"[permanent dead link]. December 21, 2010. Accessed December 26, 2010. This page was last modified on 5 May 2017, at 07:48.